The story of Behnke Nurseries is the epitome of the American dream. A young man from Germany immigrated to the United States to seek a better life for himself while carrying on the family tradition. 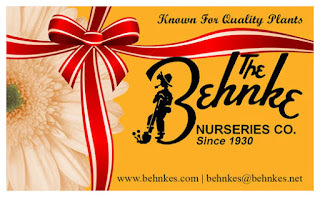 Now a local landmark, Behnke Nurseries began over 75 years ago in Beltsville, MD, through the hard work and determination of that young man, Albert Behnke, and his wife Rose. Behnke gift cards are the perfect gift for the finicky plant lover in your life. They can spend it now or wait until spring. The possibilities are endless with the Behnke gift card. The amount you select could grow into a new tree, window box garden, or a beautiful rose bush, not to mention a garden bench or decorative statue. Purchase online (http://shop.behnkes.com/product/behnke-gift-card/) or call the store and order over the phone at 301-937-1100. Email WashingtonGardener@rcn.com by 5:00pm on October 30 with “Behnke Nurseries” in the subject line and in the body of the email. Include your full name and mailing address. Tell us which was your favorite article in the October 2018 issue and why. The gift card winner will be announced and notified on November 1.